The negative image on the photographic plate in which the body shows a positive image. Note the blood from His arms and scourge marks appear as they should. Through the centuries the miraculous aspects of the Holy Shroud of Turin have awed believers and skeptics the world over. Even modern technology has proven the authenticity of the Holy Shroud time and again, as well as unlock many hidden features including the three-dimensional qualities of Our Lord’s bodily imprint. This inspired several scientists, mostly pathologists, chemists and physicists, to form a group known as STURP to make a detailed study of the phenomenon. Toward the end of Our Lord’s life, several heated confrontations between Him and the Scribes and Pharisees occurred in the holy precincts of the Temple. Our Lord patiently asserted that He and the Father possessed the same Divine Essence. But the Scribes and the Pharisees refused to believe the Truth that stood before them and maneuvered to have Him executed in the most barbarous and agonizing manner. Christ suffered the brutal tortures, blows and floggings to His sacred flesh, then the savage crucifixion and death to rescue mankind from an avalanche of sins that had placed a curse upon them. So bad had his condition become that only through Our Lord’s enormous suffering could mankind be reconciled with God. Joseph of Arimathea and Nicodemus took Our Lord’s body, bound it in a linen cloth, and laid it in a tomb recently cut into rock. On Easter Sunday morning, some Apostles and disciples discovered that the body of Jesus had left the tomb, leaving behind the 14 foot by 3½ foot linen cloth, but on that cloth He left a minute record of His Passion to show His infinite love for us. During His lifetime and after the Resurrection, Christ pursued His profound occupation as a teacher only with some difficulty, not because He lacked the ability to teach—certainly not—but because carnal man is slow to accept supernatural truths. Moreover, there is always an influential, perverse element in society that fights against transcendental verities as the Scribes and Pharisees have illustrated. And so Our Lord with loving patience found innovative ways to continually teach His profound truths to a slow and preoccupied audience. The Shroud of Turin falls into that category. Although evidence of the Shroud’s existence can be traced back to the early days of the Church, it did not enter in the historical cognizance until it came into the possession of the House of Savoy in 1453. The Savoyard dukes kept the winding sheet at the beautiful Sainte Chapelle next to their castle at Chambery, high in the French Alps. There a disastrous fire broke out in 1532 and melted the silver reliquary. The already burning Shroud was pulled free and doused with water, but some damage had occurred. Nevertheless, the image of Christ remained virtually unharmed. Duke Emmanuel Philibert (1528–80), a talented commander who served both Charles V and Philip II with distinction, transferred his seat and Christ’s burial wrap to Turin on the Italian side of the duchy, where it has remained ever since. After the transfer, the Shroud gained widespread acceptance among Catholics as the holy relic that enveloped Our Lord’s lacerated body before His Resurrection. Kings and queens, members of Christendom’s most noble families, illustrious prelates and pious religious, some since canonized, traveled to Turin to venerate the blood-stained linen, which attests to their belief in its authenticity. Shortly after the transfer, Saint Charles Borromeo made a pilgrimage on foot from his diocese in Milan for a private showing, followed by a public exhibition with 40,000 in attendance. Early in the seventeenth century, the Shroud was viewed by Saint Francis de Sales and then some years later by his spiritual protégé, Saint Jane de Chantal, foundress (along with Saint Francis) of the Order of the Visitation of the Virgin Mary. Pope Pius VII venerated the Shroud with great tenderness on his way from Rome to Paris to crown Napoleon at the latter’s insistence. Eventually arrested and transported to Fontainebleau in France for several months, he again venerated the relic with tender devotion upon his return to Italy after Napoleon’s defeat. Twice in the next century, Saint John Bosco, founder of the Salesians, venerated the Shroud, on the second occasion with boys from his Oratory. The foregoing record has been inserted to indicate the outstanding reputation the Shroud had acquired over the centuries. But it can be argued that it shows little else than admirable Catholic piety. Then, beginning in 1898, scientific and medical revelations provided authenticating certainty. Left: How the Shroud appears to the naked eye. Right: The Shroud with its colors inverted as it would appear on a film negative. 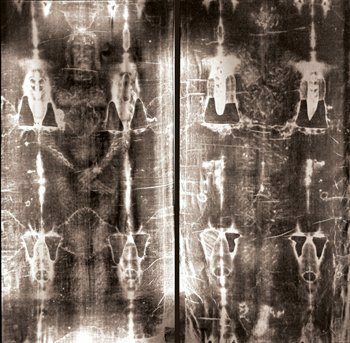 A scientific breakthrough of monumental proportions occurred in 1898 when Secondo Pia, an Italian lawyer who had experimented extensively with the recently discovered art of photography, took a photo of the Shroud. In the darkroom, as he immersed the plate into the chemicals for development, astonishment and excitement arose in him, for instead of the usual negative he saw a positive image of Christ’ lifeless body. After comparing the bodily image on the linen with what was produced on the plate, he then realized that as far as the body was concerned the Shroud was equivalent to a negative plate. To any reasonable mind, this certainly precluded any medieval forgery. It was simply impossible for a forger or any other artist to anticipate the photographic developing process centuries before it was invented. The great artists, Fra Angelico, Michelangelo, Da Vinci, have all admitted the utter futility of trying to render even a reasonable likeness of God the Son, but that is precisely what Christ has done for us. Moreover, He succeeded in showing us the serenity, nobility and power of His nature, even after the disfigurement of a terrible beating. The VP-8 analyzer, designed to map craters on Mars, produced a three-dimensional image of Our Lord. The VP-8 analyzer computes distance and elevation, properties not contained in any known paintings or photographs. Two young scientists, Paul Vignon, a Catholic, and Yves Delage, an agnostic, championed the new discovery, but ran into a wall of obstruction and skepticism. Despite overwhelming evidence to the contrary, the French scientific community for the most part refused to accept their conclusions, a scenario of disbelief that will continually play itself out in the future as it had in the past. Although the image of Our Lord’s body showed up reversed in the photographic negative, the second image, the bloodstains appeared as one might expect, i.e., as white spots. However, the positive print provided a wealth of information for medical investigators unobservable on the cloth itself. After the photographic sessions of 1898 and the subsequent dispute, the Shroud lay undisturbed in its reliquary until two public exhibitions in the early 1930s. During this period, another series of photos were taken and intensive research conducted by Dr. Pierre Barbet, chief surgeon and professor of anatomy at one of Paris’ leading hospitals. Adjusting the evidence on the Shroud to the chronological order of Christ’s Passion, we can start by analyzing the head wounds. Abrasions and swelling cover Our Lord’s entire head, especially the right side of His face below the eye. The cartilage in His nose had been fractured close to where it joins the bone. These injuries had been caused by a heavy stick about two inches in diameter wielded as a club. Christ was scourged by a Roman flagrum that had two balls of lead shaped like a dumbbell at the end. The beating must have been severe (far worse than the Jewish 40 lashes minus one) for obviously only those bruises that drew blood showed up on the linen. Yet over a hundred have been counted, mostly on the backside. The blood flows emanating from the scalp indicate the Crown of Thorns was actually a cap of long, sharp thorns beaten against the head with sticks. So graphic are the resulting rivulets that many physicians can distinguish between blood flows from arteries from those of the veins. Finally, the blood flows on the arms and the stains from the wounds on his wrists reveal the acute agony that Our Lord endured during the three to five hours that He had hung on the Cross. We must keep in mind that He was attached to the wood by only three nails, or more properly, spikes. These spikes carried the entire weight of a 175-pound man who was forced to constantly change positions. When a man is hung by his arms, the body sags, acute pains develop and he begins to suffocate (asphyxia). To alleviate this condition, he pushes up against the spike driven through his feet, which just transfers the agony elsewhere. And so the victim of this cruel torture keeps changing his position until exhaustion or the unendurable pain, or both, overtake him. In the early 1970s, technological advances unlocked many hidden features. The body image lies only on the topmost fibrils of the threads and does not penetrate any deeper as paint or any liquid substance would. Moreover, since the image without any enhancing equipment could not be seen within six feet and required a viewer to stand beyond that distance, any forger would need a very long paintbrush. But the value of this information went far beyond any refutation of a forgery. Further studies of the body image when analyzed by the VP-8 analyzer equipment that uses light waves produced a three-dimensional image. The intensity of dark and light represented the distance which part of the body lay from the Shroud covering at the moment of impression. When that information was entered into a special computer, a three-dimensional image resulted. This positive image shows the damage and repairs caused by the 1532 fire. Examination of the three-dimensional image also reveals two small coins over His closed eyes. One gives every indication of being minted in Palestine around 29A.D. The smallness of the coin and the meaning of its inscription leave some room for argument, but it provides another line of evidence. 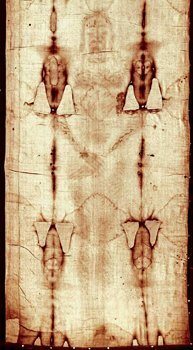 News of the three-dimensional qualities of the Shroud’s bodily imprint inspired several scientists, mostly pathologists, chemists and physicists, to form a group known as STURP (Shroud of Turin Research Project) to make a detailed study of the phenomenon. They made arrangements for a hands-on examination at the conclusion of a scheduled exposition in 1978. In October, 32 scientists, engineers, and photographers arrived in Turin with 72 crates of equipment weighing eight tons. Religious orientations ran the gamut from Catholic to Protestant and Jewish to non-believers and most were highly skeptical. The pathologists and other physicians, however, noticed that the wounds were anatomically accurate and precise in their details. They confirmed that the nails went through the wrist, not the palms as conventional artists before the twentieth century depicted. The chemists revealed that the bloodstains were composed of actual blood and after careful study determined that the victim died a violent death after being scourged and beaten. 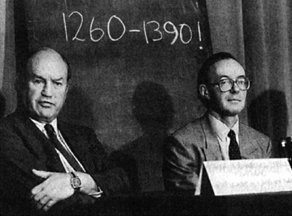 Dr. John Heller, a physician and biochemist from Yale summed up the team’s findings: “It was evident from the physical, mathematical, medical, and chemical evidence that there must have been a crucified man on the shroud.” If that is indeed the case and all evidence supports that conclusion, the question remains: Who was it? The historical record, which includes the New Testament, allows for only one answer: Jesus of Nazareth. This is not the end of the story because life on earth is not a fairy tale where everybody lives happily ever after, but rather one of conflict between acceptance or rejection of supernatural truth. 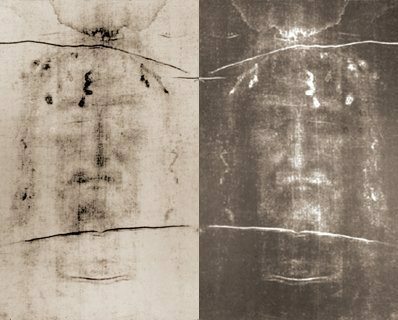 On the morning of October 14, 1988, the world awoke to shocking newspaper headlines on a subject that rarely even makes the front pages: “The Shroud of Turin declared a fake.” This bit of hyperbole resulted from three badly managed carbon 14 tests of cloth snipped from the Shroud. Since the casual, unsuspecting reader thinks such tests are hallowed science at its best, everybody thought the case was closed, especially when the Archbishop-Cardinal of Turin put up a rather weak defense. Not only is the case not closed, but because of the sloppy, unprofessional conduct of those involved, the result can easily be challenged. Because new procedures of testing small samples were going to be used, a trial run was prepared, the results of which turned out to be unacceptable. In one recorded instance, testers misidentified the age of a specimen by as much as a 1,000 years. Prior to the tests, a series of safeguards known as scientific protocols were to be incorporated. Seven laboratories were chosen to do the testing, whose work would then be analyzed by three oversight institutions. As part of the original arrangement, STURP was to participate in the choice of location for the cloth sample for radiocarbon dating and then to proceed with another intense round of examination to supplement the results of 1978. None of this ever occurred. During the 1980s, while STURP was preparing for an even more comprehensive examination of the Shroud, a counter-movement developed opposed to their activities. Harry Gove, a nuclear physicist from Rochester University and a promoter of a new method of carbon dating, took over the leadership of this movement and aligned himself with Edward Hall of the Oxford testing laboratory and Michael Tite of the British Museum, among others. Despite STURP’s monumental achievements in proving that the Shroud enveloped the body of a man consistent with the sufferings of Jesus Christ, Gove began a scurrilous campaign of shameful duplicity to eliminate them from any further testing. He boasted of his success in this endeavor in a memoir published in 1996. To arrive at the cause of the two distinct images, the body image on the topmost fibrils and the blood, which soaked into the linen, leads to speculation or, to be more accurate touches on the miraculous. 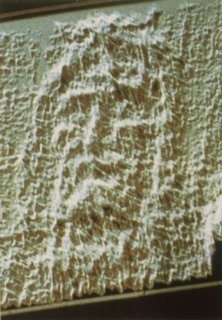 The most reasonable explanation for the former came from Joseph Heller who stated, “It is as if every pore, and every hair of the body contained a microminiature laser,” paraphrased by another scientist as a “burst of collimated radiant energy.” Since some of the anatomically and precise and complete blood marks appeared on the Shroud without having any contact with the cloth, the conclusion can be reached that once the blood soaked into the cloth it was no longer on the body as some scientists have theorized. Finally, one question must be asked. Several lines of evidence, at least 10 to 15, have ascertained the authenticity of the Holy Shroud and one controversial procedure claims the opposite. Why does the world believe the latter? Editor’s note: The bulk of the material for this essay came from: Mark Antonacci, The Resurrection of the Shroud: New Scientific, Medical and Archeological Evidence (New York: Evans, 2000) and the works of Ian Wilson, principally, The Blood and the Shroud, 3rd ed. (New York: Free Press, 1998). This entry was posted in Catholic Perspective and tagged blood, Catholic, Christ, Church, God's Gift for Our Time, history, Holy Shroud, Holy Shroud of Turin, Passion, research, science, thorns, Turin, wound by Jeremias Wells. Bookmark the permalink.